This week we started with snow.........a lot of snow. There was a good 4 inches on the ground and it stuck around till Friday. One bit of good news is the snow didn't bring down too many big branches like you see in this picture. It shouldn't take long to clean up, but it was another week of course closure and unfortunately with the snow we couldn't work on 12 tee. Speaking of 12 tee. Here's a pic of the new teeing ground with snow cover. It's a cool picture because you don't see all the dirt and you can really envision how the hole will look from the new tee. Look how the trees frame this tee shot. It's not a very narrow tee shot compared to most holes at Tacoma but as we all know, the landing area is pretty unforgiving. What's nice is as a player you have a choice. You can play a fade or a draw off the tee since both oak trees can easily be carried if you're playing from an appropriate tee that fits your game. With the snow cover our options were limited as to what we could do this week on the golf course. We did take care of removing those small firs on the right of 10 because we could work from the road. Keep in mind these trees will be replaced with a more appropriate tree that provides better protection for the pedestrians on the road. Our attention moved indoors for some projects that were well overdue. 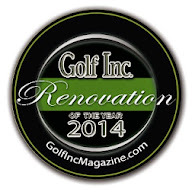 We painted the inside of the maintenance facility and the restrooms on 13 tee. We also got every piece of equipment outside for a thorough bath. Lastly, we all knew this was coming but just so you know the train has arrived. I clicked this picture Friday and as you can see there is an Amtrack train on the rail. This is the first time I have ever seen an Amtrack train on that rail. As announced, the rail is ready for testing and clearly they are testing. This train was moving slowly and I know that the objective of this test was to just make sure all the road crossings are working properly. I'm sure that soon we will see them testing at full speed which we're told will be about 80 mph. The crossing at Thorn Lane on the south end was working and it was loud!!! For more information on the new trains click HERE.